The Prelude and Fugue for organ in B minor, BWV 544, was composed during Bach's tenure at the Thomaskirche in Leipzig. It is an excellent example of Bach's mature essays in the genre, which begin to appear in his later Weimar years. 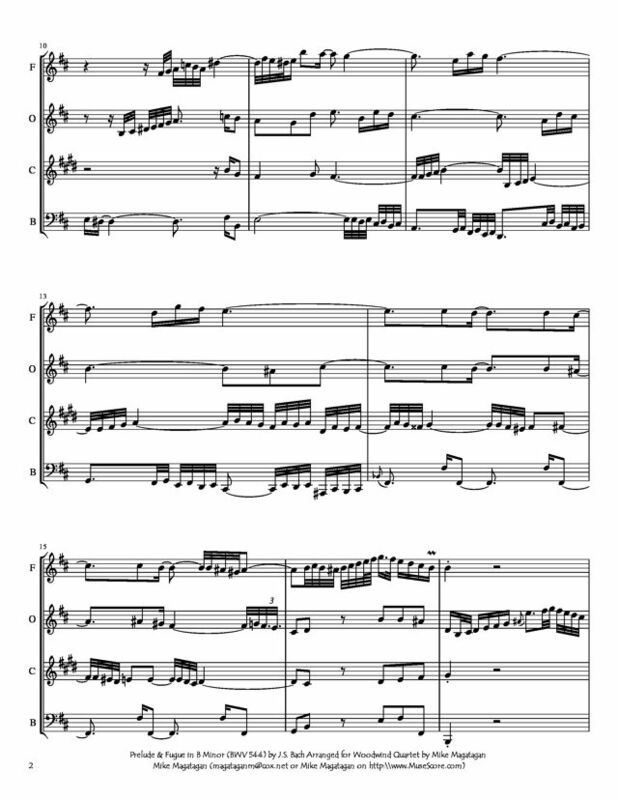 In 6/8 meter, the Prelude is one of Bach's most rich and forceful. An intricate opening idea becomes even more involved upon repetition, after repeated octave leaps in the bass create a sense of anticipation. The prelude is somewhat sectionalized, its complex, thick material interrupted occasionally by moments of rest in which only one voice continues. The first of these introduces a section without pedal that becomes increasingly florid until the return of the leaping octave in the bass and its attendant material, acting like a refrain. 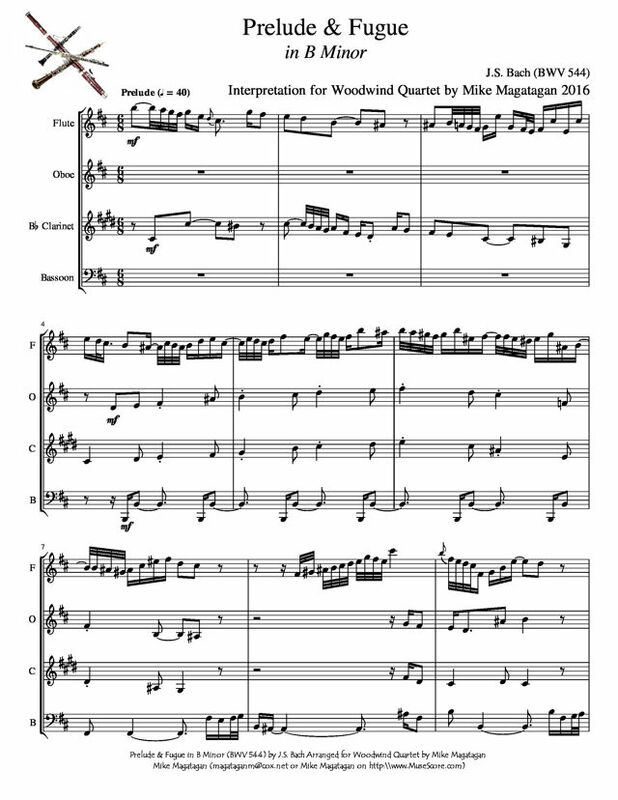 At the end of the prelude, more repetitive octave leaps in the pedal, reminiscent of those beginning in the third measure, provide the foundation for a chain of suspensions that creates a tremendous forward impetus, pushing toward the close on B major. Bach chose a subject for the B minor Fugue that is very different from the material of the prelude. Only two measures in length and consisting of turning scale passages, the plain subject borders on the uninteresting. However, it does succeed in outlining confirming tonic in no uncertain terms and provides material enough for an eighty-eight-measure fugue. The counterpoint to the second subject entry, in the tenor range, becomes a permanent counter-subject that is much more active than the subject. All four voices sound at each of the ensuing entries, which jump from one register to another unpredictably. Bach takes his subject through the subdominant and two major keys before finally landing on the dominant to introduce a very long developmental segment. At a point in the middle of the fugue, after many measures without pedal, the thread of Bach's argument seems to unravel until the subject enters on the tonic, just before the pedal part resumes. The preceding relaxed atmosphere increases our perception of the intensity of the end of the work, which closes on B major. 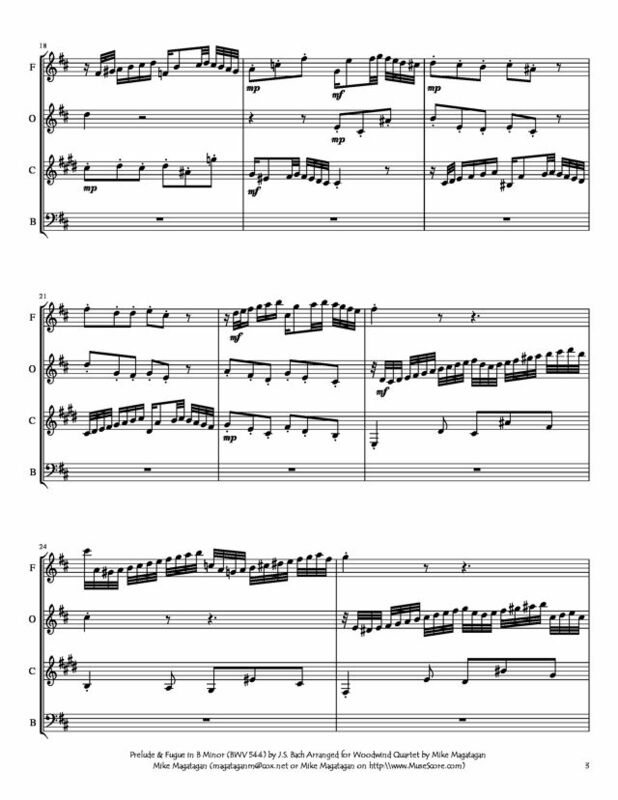 Although originally composed for Organ, I created this modern interpretation for Woodwind Quartet (Flute, Oboe, Bb Clarinet & Bassoon).